Search all homes for sale in West Calgary below! West Calgary offers some of the finest lifestyles in Calgary. With the addition of the West leg of LRT, this part of Calgary had quickly risen in demand and home prices had also reflected the increase in popularity. The average price in this area is well beyond $750,000, but some great opportunities can be still hidden near $200,000. High-end custom homes are well known on the West side of Calgary with prices often exceeding ten million dollars. Most homes located in the neighbourhood east of Sarcee Trail were built around 1945 and later. The average size of these homes in the area is 1,239sq.ft. which is considerably smaller than what most home buyers are accustomed to building in the 21st century. Primarily due to the older type houses in the neighbourhood, the average price of a home in these older communities is hovering around the $500,000 mark. The communities located on the west side of Sarcee Tr. have been established starting in the late 70’ with the community of Coach Hill as being one of the firstly developed communities in West Calgary. On average, homes are 1,863sq.ft. in size and have been selling for approximately $639,000 on average. Condos in West Calgary are also a popular choice for all home buyers as many have been built near the new LRT station making commuting a breeze for residents. West Calgary townhouses is a great option for anyone who is thinking of having a bit more space to themselves with a sense of having more independence from neighbours and enjoying the benefits of zero maintenance tasks beyond their walls. Prices of homes in West Calgary have always been considerably priced higher than in any other parts of Calgary. It’s not uncommon to see the market values of homes to be at least 10% higher than anywhere else in the city. The reputation of the communities and the demand for real estate in West Calgary had naturally supported home values and caused them to inch higher even in challenging market conditions when the market was less favourable to homeowners residing in other parts of Calgary. In the first six months of 2016, about 8% of total sales of homes in West Calgary was sold above a million dollars. The total number of sold real estate accounted for above $1 million were 64 dwellings out of 823 total sales in West Calgary. While in the rest of Calgary only about 3.3% of the homes that have sold were listed over a $1 million. The average combined price of all the homes, condos and townhouses sold was $608,534 which is the highest amount when compared to anywhere else in Calgary. Many of Calgary’s most desirable luxury properties are located in West Calgary. Prestigious properties include massive mansions, custom built estate homes, properties with a swimming pool and often homeowners are blessed with magnificent views of the Rocky Mountains. The district of West Calgary encompasses luxury real estate with high qualities for interior and exterior finishes. Homes frequently showcase rich architectural finishes on perfectly manicured streets among vast expanse of green spaces between the properties and within the surrounding community. Occasionally, luxury home prices in West Calgary reach all the way up to the $8 to $10 million range. However, a majority of the luxury homes in West Calgary are hovering between $1 to $3 million. Demand for homes priced above a million dollars in West Calgary has remained high. In fact, in the first six months of 2016, the number of sold homes priced over $1 million had increased by 35 percent to 58 sold homes from 43 units in the previous year. Future developments and the creations of new communities within the city boundaries of West Calgary remain restricted for the foreseeable future. The new community of Harmony located just to the west of Calgary, close to the Springbank Airport is planned to develop a community on a 687-hectare land. The future residential development currently encompasses ranches and farmlands, but according to the developer of HDI, the area is to be developed as an estate and acreage style community. Based on postal code statistics, it is among Alberta’s wealthiest communities and most sought after in Canada. The developers of Harmony claim it to be the first master-planned community in the area. Future development will include townhouses, multi-family condos, and even senior resident housing. An astonishing 140-acre lake and wetland are planned along with a national golf course designed by world famous Phil Mickelson. There are several new construction homes for sale in West Calgary. Already established communities such as Currie Barracks have new condos for sale in the $500,000 to $600,000 and a handful of single-family homes are priced just over a million dollars in the area. The community of North Glenmore Park is a small, tightly-knit community located next to the Glenmore Reservoir and usually, sees rebuilt homes go on the market in the price range of $1.2 million and upwards. Glenbrook is becoming more popular for infill style construction of new homes as the borders of the inner city appear to be stretching further away from downtown Calgary. The community of West Springs still has a few remaining empty lots for sale with the possibility of brand new homes to be built on them. Most of the remaining vacant lots available for constructions of single-family dwellings in West Calgary are located in Aspen Woods. The prices of these homes commonly start at the $1 million mark, and others are frequently priced between $1.2 - $1.4 million. The communities of West Calgary are located only 15 - 20 minutes from downtown Calgary, offering quick access to city life with the peace and harmony of what suburban living is desired for. Homes for sale in West Calgary are highly sought after by first-time home buyers, luxury home buyers and everyone whose budget is in-between easily going to find their perfect home in this area. The district of West Calgary is located on the west side of Calgary as the name also suggest. Commuters heading to downtown Calgary on a daily basis are grateful for the easy access that major connecting roads and public transportation have to offer. The west leg of the LRT system was completed in 2012 reaching all the way to 69th Street in Springbank Hill. Traveling to a destination other than downtown Calgary, Glenmore Trail serves as a major artery road for drivers. Sarcee Trail is currently the best choice for drivers heading north and south in the area. Within the coming years, West Calgary is going enjoy the development of the future ring road that will pass by the outside community boundaries of Aspen Woods, Cougar Ridge and Springbank Hill and ultimately wrap all the way around the city to provide convenient transportation to all Calgarians. Residents living in the area can spend their free time doing outdoor activities that involve bicycling, walking or jogging on miles long winding paths surrounded by nature. Some of Calgary’s best recreational facilities and outdoor parks are located in West Calgary. The Weaselhead Natural Area spreads over 237 hectares of a park that ties into the west border of Glenmore Reservoir. The park was established in 1980 for outdoor recreational users. It offers a rare opportunity for outdoor enthusiasts to experience nature within city boundaries. Weaselhead Flats has miles long hiking trails and a diverse habitat for wildlife. Locals often see Common Loons, Tundra Swans, Elk and Black Bears frequently visit the area as well. Edworthy Park is situated alongside the Bow River towards the northern edge of West Calgary. The park was once part of the Cochrane Ranch and acquired by Thomas Edworthy in 1883. The family had operated a lucrative garden market that supplied fresh vegetables and fruit to CP Rail crews and new settlers in Calgary. Sometime after they cultivated the land, Mr. Edworthy had discovered sandstone on his property which prompted him to enter the sandstone business to supply building materials for many buildings that are still standing in Calgary. The land was later purchased by The City of Calgary in 1962 to develop the park to be used for outdoor recreation. The site includes a large playground, picnic areas with tables, endless pathways and vast areas of green space. Nestled just minutes away from downtown, West Calgary offers homeowners proximity to city life with the tranquillity of suburban living. Locals can spend their time doing outdoor activities that reflect their surroundings, from bicycling on beautifully laid out trails to having picnics at artfully crafted neighbourhood parks. Homeowners in West Calgary also enjoy taking advantage of the many attractions that surround this part of the city, such as the Glenmore Reservoir, Glendale Meadows, the Shaganappi Golf Course, and the Pinebrook Country Club. With an abundant selection of outdoor recreational activities and peaceful meadows for relaxation, residents in West Calgary can maximize their downtime when away from the city. Whether spending the day at a country club or the nearby Edworthy Park, homeowners never tire of utilizing the natural resources that are located so close to their homes. To say West Calgary’s real estate market has been booming would be an understatement. This part of the city has consistently remained a popular choice for residents who desire a reasonable proximity to the downtown area. In fact, the market in West Calgary often surpasses surrounding areas because it streamlines access to downtown Calgary via the Sarcee Trail or the recently developed C-Train. With various sizes of homes as well as condos available to choose from, homeowners can find properties that suit their needs without compromise. However, buyers should expect higher prices for these desirable properties because West Calgary Homes, located in proximity to the Foothills tend to be the most expensive on the Westside. Some properties in this area are priced at millions of dollars, but there are more budget-friendly options available in other neighbourhoods. West Springs, Signal Hill, and Aspen Woods are a few of the neighbourhoods that have grown in popularity, as they offer beautiful natural surroundings in addition to gorgeous views of downtown Calgary and the Rocky Mountains. In fact, many West Calgary homeowners are lucky enough to have properties with sweeping views of both the lights of the city and green meadows, so they don’t have to compromise. This is largely the result of developers focusing their builds on the edge of the city, which means better landscapes for every buyer on the block. If you’re considering purchasing a home in West Calgary, AB, then it’s important to anticipate higher prices than you would see in surrounding areas of Calgary. It’s very much a seller’s market due to the constant demand for properties, and homes are 10-20% higher than in other parts of Calgary as a result. This often pushes homes into the million-dollar range, although many choices are above and below this price point. Prospective buyers should also prepare themselves for a quick sales process because homes get taken off the market in days and even hours. This is especially true if you’re a buyer who is planning on taking out a mortgage, as all-cash buyers are prominent and could easily bump you out of the deal you wanted. If you see something you like, then act fast, so you don’t risk losing out on the home that you wanted. Single-family properties in West Calgary can reach into the millions, but they’re listed in the low $450,000’s. However, it’s important to remember that this does depend on the area as well as other features of the home. To put the price in perspective, in 2015 the median listing price was around $519,000. When it comes to townhouses or condos, those start around the mid $100,000 and increase depending on the location, floor, and amenities of the property. 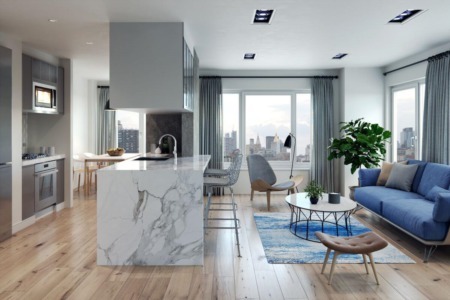 While it’s likely to find an affordable condo, it’s important to remember that luxury units can go for millions because of their views and amenities. Multiple offers on homes for sale is incredibly common in West Calgary because it’s such a high-demand market. In 2015 this competition led to many households in the area being sold for more than their original listing price, sometimes even reaching 10% or more over. However, the majority of homes did sell within 97.2% of their asking price, and they were sold in just a few week or less. Coach Hill Calgary real estate was developed in the late 1970's and is comprised of mixed development, including single-family detached, townhouses and apartment-style condos. Coach Hill homes offer excellent access to the downtown via the Bow Trail corridor. The community is centred along 5 Street SW, it is bordered by Elbow River to the south, by Uptown 17th Avenue to the north and by Fourth Street to the east. Homes in Cougar Ridge are surprisingly varied. The Olympic Village located in the north-east corner of the community was built on the escarpment facing Sarcee Trail and the Bow River to host athletes during the 1988 Winter Olympics and was subsequently converted to condominiums. Cougar Ridge homes are just minutes from a ten-screen multiplex cinema in nearby West Hills Town Centre and a golf course across the #1. Canada Olympic Park's world-class facilities are adjoining, with ready access to the Rockies via the Trans-Canada Highway. Cross Country skiing and snowmobiling & 4-wheel driving are found a half hour west of Bragg Creek. Exclusive Crestmont properties display a variety of architectural styles that include French Country, Arts & Crafts, Tudor, Georgian, and Colonial Revival. Depending on the home, Crestmont Calgary real estate starts at about $550’s, extending to just under $1 million. Most of the homes have stunning mountain views and feature upgraded luxury amenities. Homes in Crestmont offers nearby access to local foothills trails for quick outdoor getaways. Drive less than an hour, and you'll arrive at the Rocky Mountains, or enjoy skiing, hiking, and golf in Kananaskis Country. The 4,000 square foot Residence Hall located right in the neighbourhood, accommodates residents year round with hall rental facilities, playground, parks and integrated pathway for long walks or bike rides. In the summer, let the kids cool off at the water play area and in the winter enjoy outdoor family skating. Discovery Ridge offers a unique location bordering the Elbow River Valley and the 93 hectare Griffith Woods Environmental Park. As a result, residents enjoy panoramic views of the Rocky Mountains and Foothills and have easy access to the park and its miles of trails suitable for walking, hiking, cycling, rollerblading and horseback riding. Sought after Discovery Ridge in West Calgary boasts professionally landscaped lots with non-stop mountain views. Inside, the list of amenities and luxurious upgrades result in one-of-a-kind showcase homes. Glamorgan real estate has easy access to a full range of athletic facilities. There are golf courses on the eastern edge of the community. The Glenmore Reservoir recreational pathways are readily available to the south of the community. There is an indoor ice arena at Optimist Park on Sarcee Trail and an indoor pool at Mount Royal College. The closest movie theatre is the multiplex cinema at Westhills. Many Glamorgan homes boast lovely views of Strathcona Heights and the Rocky Mountains. Homes in Glenbrook have access to a full range of athletic facilities. There are golf courses on the eastern edge of the community. The Glenmore Reservoir recreational pathways are easily accessible to the south of the community. There is an indoor ice arena at Optimist Park on Sarcee Trail and an indoor pool at Mount Royal College. The closest movie theatre is the multiplex cinema at Westhills. Houses in Lakeview are close to just about anything you'd want for recreation. The Glenmore Reservoir trails are close by, and you can go all the way around the reservoir or all the way downtown. The Weaselhead Flats wilderness area is at the western end of the reservoir and is the favourite entry point into Calgary for deer, elk, wolves, and bears. The Calgary Rowing Club and Calgary Canoe Club are located at the blue boathouse, at the end of Crowchild Trail, just inside Glenmore Park. The exclusive Earl Grey Golf Course is on the eastern end of the community. The indoor pool and indoor ice arena at Glenmore Park are to be found just across Glenmore Trail. Patterson is a residential neighbourhood consisting of apartments, houses, townhouses, and condominiums. The 134-acre community has a 300-foot elevation drop with both rolling hills and ravines, providing excellent north views of the Bow River Valley and Calgary's downtown. Learn more about the Patterson neighbourhood. The neighbourhood of Rutland Park is a well-kept secret. Developed in 1952, Rutland Park is an older community with streets that are lined with lovely mature trees. The predominantly single-family Rutland Park homes sit on large, well-spaced lots. Located in West Calgary, homes in Rutland Park are bounded to the north by Richmond Road and 33 Avenue, to the east by Crowchild Trail, to the south by Glenmore Trail and to the west by 37 Street S.W. The community of Signal Hill is made up of residential neighbourhoods of Sienna Hills and Signal Ridge located at the centre of Broadcast Hill. Close to Signal Hill homes, near Sirocco Drive, is a boarded hockey rink, ball diamonds, and soccer fields, and tennis courts are just east of Battalion Park. Westside Regional Recreation Centre is located on the western edge of the community. The hill that forms Signal Hill's south border is part of Battalion Park, honouring the four army battalions that trained there during the First World War. Springbank Hill was formerly part of the unincorporated neighbourhood of Springbank, in the Rocky View district. The community has developed into large acreage neighbourhoods that are now among the wealthiest regions of Greater Calgary. Springbank Hill is close to the Westside Recreation Centre, the 10-screen multiplex cinema in nearby West Hills Town Centre, and two golf courses just west of the community. Cross-country skiing, snowmobiling, and 4-wheeling are found within half hour travel west in Bragg Creek. Real Estate in Valley Ridge is situated in an area with 50% green space and range from condos to high-end golf course homes. With a broad selection to choose from, you should have no problem finding your dream home in Valley Ridge. The Valley Ridge Community Association provides residents with two ball diamonds, a soccer field, and playground for the kids, while the scenic Valley Ridge Golf and Country Club has 18 holes of championship golf and offers Valley Ridge residents discounted green fees. The golf club also has newly renovated banquet facilities, providing the perfect setting for weddings, conferences or special events. West Springs real estate is represented by executive/estate homes and townhouses on a variety of lots ranging from small to over 4 acres. The central park, off Sierra Morena Boulevard, which has both basketball and beach volleyball courts, and will eventually contain a public school, community centre, soccer fields, ball diamonds and a view park. The park is part of the north-south recreational pathway that runs through the community. Behind the park is Alred's Driving Range.